Trillions of dollars were expected to be transferred and a record number of millionaires and billionaires created. Philanthropy was changing in other ways, too. Acting on a heightened desire for community, large numbers of people were giving back in new and lasting ways. 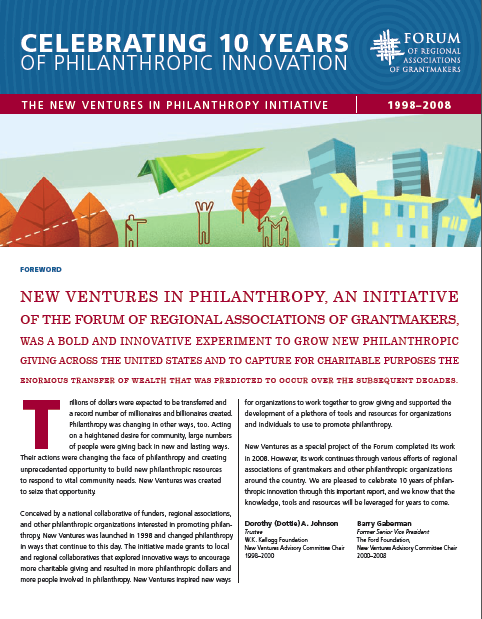 Their actions were changing the face of philanthropy and creating unprecedented opportunity to build new philanthropic resources to respond to vital community needs. New Ventures was created to seize that opportunity. and individuals to use to promote philanthropy. New Ventures as a special project of the Forum completed its work in 2008. However, its work continues through various efforts of regional associations of grantmakers and other philanthropic organizations around the country. We are pleased to celebrate 10 years of philanthropic innovation through this important report, and we know that the knowledge, tools and resources will be leveraged for years to come.